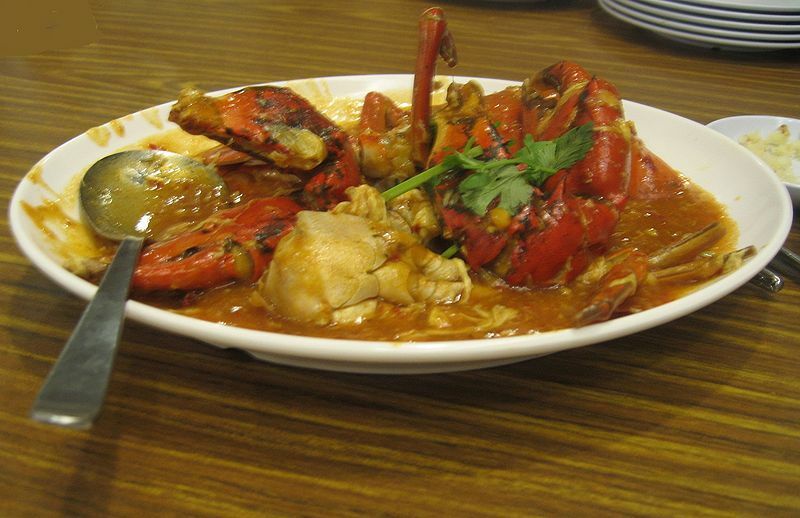 Chili crab is a seafood dish originating from Singapore. Mud crabs are commonly used and are stir-fried in a semi-thick, sweet and savoury tomato and chilli based sauce. It can be widely found at Malaysian and Singaporean seafood hawker stalls, kopi tiams or restaurants. Despite its name, chili crab is not a very spicy dish. Although mud crabs are commonly used, other varieties of crab that have been used include Flower crab / Blue swimmer crab and Soft-shell crab. Chilli crab sauce is usually semi-thick, sweet and savoury although there are some that are served watery. The base of the chilli crab sauce is usually chilli sauce and tomato sauce. It is thickened with a thickening flour. Flavoured with garlic, rice vinegar, soya sauce and etc. Beaten chicken eggs are added near the end of the cooking process to create egg-ribbons in the sauce. 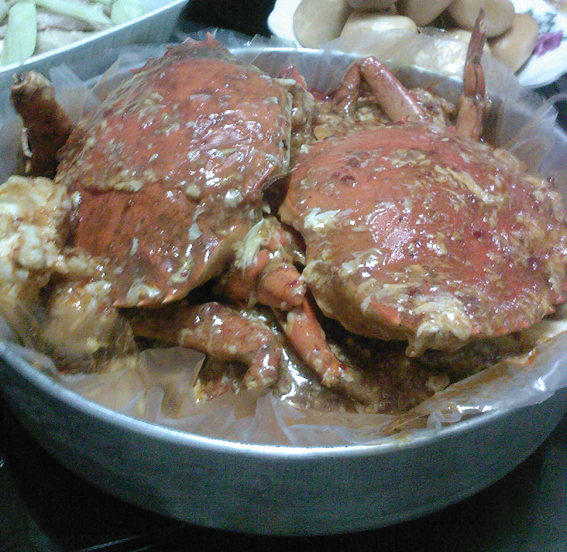 Left: Crabs in chilli crab sauce. The crabs are lightly fried or steamed first with ginger, before being stir-fried in a chilli sauce made mostly with chilli paste, ketchup, and chicken eggs. The shells are usually partially cracked before cooking for ease of eating later. It is commonly garnished with coriander leaves (cilantro). Heat the oil in a wok or shallow saucepan over high heat. Add garlic and stir-fry for 1 minute. Add the chilli, stir-fry till fragrant. For mud crabs, add at this stage. Fry well till shells start turning red, add sauce ingredients stir well, cover with lid and simmer till shells are red. Break eggs into the wok and streak with a fork, simmer till cooked. Squeeze lime juice over and stir in scallions. For soft-shelled crabs, cut each crab into four, dry well, dredge in flour and deep fry till golden brown and crispy. Make the sauce as above, but omit the mud crabs. Toss soft shelled crabs in sauce just before serving. Plain white rice may be eaten with chilli crabs too. The dish is best eaten with your fingers. Mop up the mouth-watering gravy with white bread or Chinese mantou.